Buying video games for children is difficult. You don’t want to buy them a game they’ll hate, but you don’t want to expose them to violence, crude language or overly-aggressive online gamers either. It’s pretty common knowledge that a lot of the games ‘designed’ for children aren’t that great. However, there are more than a few top quality games perfect for kids. The Super Mario Bros franchise has been going for years, but the game has never really changed. You guide a chubby Italian plumber (or his brother) through various worlds, collecting coins, jumping on blocks and squashing baddies along the way. It’s a simple but classic formula that kids have enjoyed for generations, and there’s no doubt your kids will love it too. The co-op mode on the Wii U version is especially good, as it lets kids play together and teaches some valuable teamwork skills! To be honest, just about any Mario game is good for kids; the new Super Mario 3D World is recommended if the young ones in your life fancy something slightly different, while Mario Party is great for multiplayer family fun. Pikmin 3 has everything you could want from a kids’ game: cute characters, a simple story and some challenging gameplay that will help develop their problem solving skills. 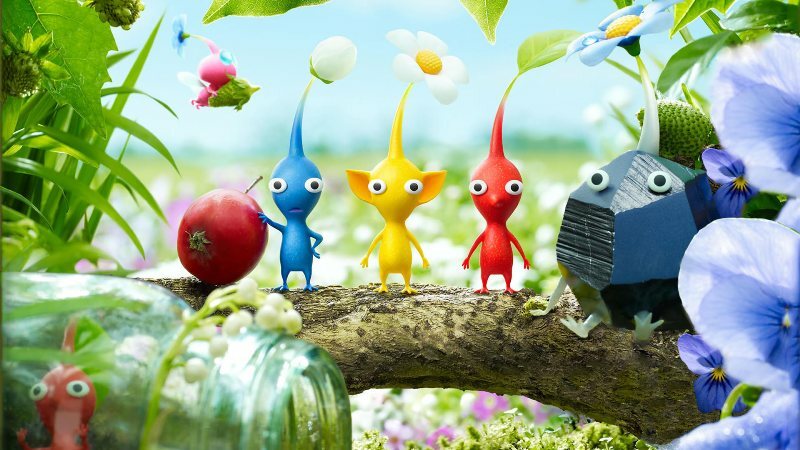 The goal of Pikmin 3 is to gather materials using an army of Pikmin, a race of vegetable-like aliens who grow in the ground. The player plants Pikmin, picks them and then uses them to help explore a distant planet. You also have to protect the Pikmin from various hostile enemies. It’s a genuinely brilliant game, and has received a lot of critical acclaim. If you do buy it, though, it’s worth accompanying children so you can talk through potential solutions and guide them through the game (it can get quite challenging in parts). Disney Infinity is a relatively simple action adventure game that lets your children play as their favourite Disney characters. Each character is accessed using a real-life figurine, which is placed on a board that comes with the game. Not only do your kids’ get a great game, but they get some great (and possibly collectable) toys too. If Disney doesn’t appeal to your kids, a Marvel version of the game was recently released too. A word of warning, though: the figurines are quite expensive and the cost of the game can mount up quite quickly. We’d recommend picking out your children’s favourite characters from the offset so they aren’t pestering you for more figurines in a month’s time! These cheery versions of the Batman and Marvel universes have become a phenomenon in their own right, combining platforming action with open-world exploration and more characters than you even knew existed. Imagine Avengers Assemble or The Dark Knight Rises with the darker moments removed and you’ve more or less got the gist. Animal Crossing is basically a kids’ version of Sim City. You play as the mayor of a small town, responsible for looking after a cute group of animals and critters. The idea of managing a town’s finances and so on might not sound like the most appealing game for kids, but the way Animal Crossing is presented will captivate them – and teach them some important life lessons too. The Xbox One isn’t the most family-friendly of consoles, with few ‘family-focused’ titles released on the system to date. Zoo Tycoon is one of the few and, to be fair, it’s a brilliant game. You manage your own zoo, setting up exhibits and caring for the animals. Although it’s a game, there is quite a lot of responsibility on the player’s shoulders, which is a good way to teach your kids some important lessons! Some aspects of the game are quite complex, so adult supervision is recommended. It’s more fun that way, anyway. Minecraft is an independently-developed open-world game that has taken the world by storm. The idea behind the game is simple. You build your own world using materials ‘mined’ from rocks, trees and various other natural sources. The only limit is your imagination (as this post shows). There are two main game modes. The main mode sees you building forts to protect yourself from nightly invasions by baddies, while the ‘create’ mode lets you build in peace. The ‘create’ mode is undoubtedly better for kids, although older kids will enjoy the extra challenge the baddies present. Rayman Legends is a rare example of a kids’ game getting the kind of review scores you’d expect from titles like Grand Theft Auto and Call of Duty. It scored a massive 9.5/10 on IGN, and it’s not hard to see why. It’s a wonderful mix of platforming action, colourful levels and even more colourful characters. There’s a co-op mode too, so the kids won’t be fighting over who gets to play next! Have you got any suggestions for our list? Share them with us in the comments and we’ll add them! And if you need to clear any space in your games collection before Christmas, why not sell games with musicMagpie?